One of The World’s Largest Makers of Cast Iron Pipes and Four Company Officials Sentenced to a Total of 147 Months Incarceration and $8 million in Fines for Flagrant Abuses of Environmental and Worker Safety Laws.  Atlantic States Cast Iron Pipe Company (“Atlantic States”), a division of McWane Industries was sentenced to pay an $8 million fine, serve 48 months “monitored” probation and pay a Special Assessment of $12,000.00.  Plant manager, John Prisque was sentenced to 70 months in prison and a Special Assessment of $525.00.  Maintenance supervisor, Jeffrey Maury was sentenced to 30 months in prison.  Finishing supervisor, Craig Davidson was sentenced to 6 months in prison and a Special Assessment of $575.00.  Former human resource manager, Scott Faubert was sentenced to 41 months in prison and a Special Assessment of $400.00. The trial beginning in September 2005 is the longest federal trial (defined in length, from jury selection to verdict) in environmental crimes history. This is the fourth in a series of cases against McWane: three other McWane divisions (Pacific States Cast Iron Pipe Company in Provo, UT; McWane Union Foundry in Anniston, AL; and Tyler Pipe Company in Tyler, TX), along with individual defendants, have been convicted following trials, or pled guilty, for committing environmental crimes. The investigation of a fifth McWane division, McWane Cast Iron Pipe Company, is ongoing. During the trial, the government presented evidence that the defendants routinely violated Clean Water Act permits by discharging petroleum-contaminated water and paint into storm drains that led to the Delaware River; repeatedly violated Clean Air Act permits by, among other things, burning tires and excessive amounts of hazardous waste paint in the furnace; systematically altered accident scenes and concealed serious worker injuries from health and safety inspectors; routinely lied to federal, state, and local officials who were investigating environmental and worker safety violations; and maintained a dangerous workplace that contributed to multiple severe injuries and the death of one employee at the plant. The company and each of the defendants were convicted of the main conspiracy count in a 34-count Indictment. Atlantic States was convicted of a total of 32 of 34 counts, which also included five counts of making materially false statements to state and federal environmental agencies and the federal Occupational Safety & Health Administration; four counts of obstructing OSHA investigations; and 22 counts of violating the federal Clean Water Act and one count of violating the Clean Air Act. 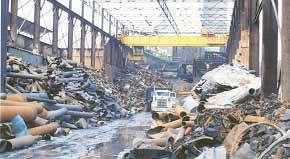 This entry was posted in air pollution, EPA enforcement, Hazardous waste management. Bookmark the permalink.